Mr. Jack has swept the crowds into the bliss of two-player enjoyment. This is why we are glad to say we will be receiving its expansion, thanks to the kind folks at Hurrican Games who will be providing us with some. 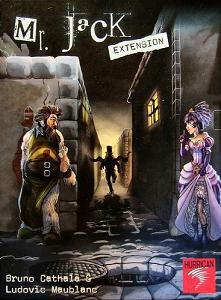 For $29.99 you can be the proud owner of new characters, twists and plots to the capturing of Jack the Ripper. John Pizer: An imposing and frightening Butcher. Madame: A beauty of a woman but not useless as some would think her to be. Spring-Heeled Man: A strangely mysterious man.